By now gamers and anyone who bothers to watch Jeopardy are familiar with the antics of Arthur Chu. Right on the heels of Mercedes Carrera’s charity announcement to help fellow adult actress Cytherea, Arthur Chu took to twitter to criticize the charity effort with a series of scathing tweets. Clearly Arthur Chu made it no secret what he thought about Mercedes Carrera’s video by attempting to call out gamergate supporters who participated. This nothing new as charity efforts by gamergate are often dismissed by SJWs as “weaponized charity”. Arthur then goes on to attack the video itself by showing his incredibly limited vocabulary for a self-proclaimed mad genius. 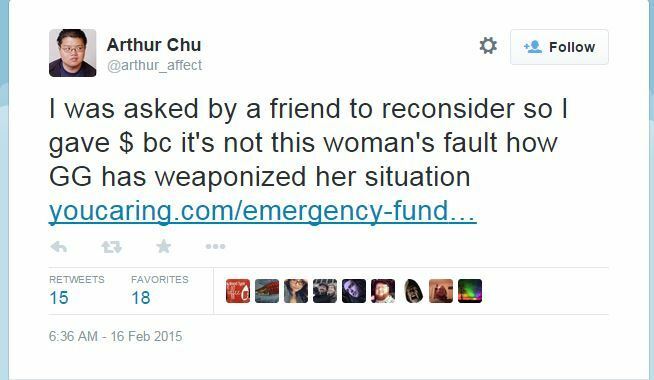 Quite frankly, Arthur Chu demonstrates his inability to understand empathy or compassion for a fellow human being. Did he ever think that maybe Mercedes Carrera has a legitimate reason to be upset? What if Ken Jennings was robbed at gunpoint, specifically targeted because he was a former Jeopardy champion? Arthur would have every right to be angered by that. Here’s where things got bizarre: Arthur Chu, despite being hyper-critical about the topic, went on to actually give money to the charity. A blogger known as the Advocationist reported the Arthur donated $50. Despite Arthur’s criticism of the events he has been the only anti-Gamergate supporter to acknowledge this charity. It’s not fully clear on what caused Arthur Chu’s ever so slight change of heart. Perhaps it was nothing more than a quick ego boost. A brief look at many of Arthur Chu’s tweets are enough to make any passer by question his sanity. Arthur’s tweets are composed of attacks on prominent Gamergate supporters such as Rougestar Games and Reaxxion’s founder Roosh V. Chu of course has also made it no secret that he’s on board with Marxist ideology and has made it clear that SJWs, including himself, have no plans on finding common ground with gamers.